Titled to evoke the existential glow of expat Prague author Milan Kundera’s 1984 bestseller, the topsy-turvy “structure” of the story reminded me more of the Gudjieffian French consumptive Symbolist René Daumal’s A Night of Serious Drinking (1938). It is nothing as weird and soul-searching as Daumal’s novel though – it’s really like hanging out at the pub with two cranky beer writers and listening to them complain about everything that is wrong with the craft beer craze. With a lot of set changes, magic, and science fictiony sleight-of-hand thrown in to create moods appropriate to the discourse. They cover a lot of ground. Beer styles, tasting vs. drinking, beer history (imagined vs. reality), corporate greed, marketing, beer vocabulary, and more: all provide grist for the authors’ mills, in an engaging and constant way. I laughed many times, which is the main reason I enjoyed the book, even if I do not feel as jaded and cynical about the scene as the characters Alan and Max do in the book. Craft beer devotees will likely find a lot of the statements in Nonsense to be offensive, if they have difficulty listening to other points of view. 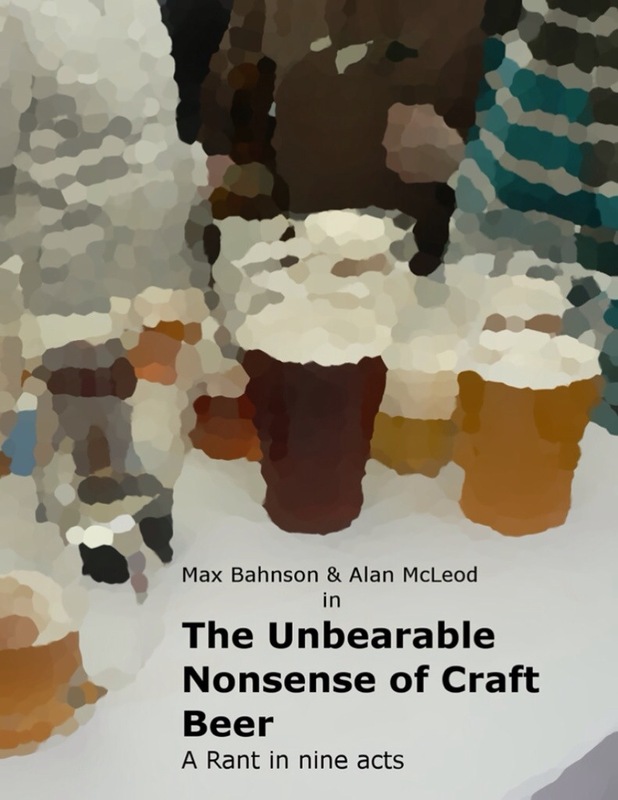 Alan and Max have done a good job of coming up with a comprehensive list of items to object to about craft beer, and of presenting it in an entertaining way. As someone who has been brewing beer a long time and drinking it even longer – although surely not as long as Alan and Max – I can see and agree with many of the points they make, even as I make a special trip to the local beer bar to meet an out-of-town brewer visiting Music City for Nashville Craft Beer Week, to interview him for this blog and to taste the rare sours he brought which were aged first in French fouders and then a second time in blackberry whiskey barrels like I did last night (this post is coming soon). The truth is, their points are good ones. Nonsense comes complete with footnotes accessible through links to Wikinotes from the e-book. I am fascinated that they could collaboratively write this – did they do it by email? Will there be a The Making of The Unbearable Nonsense of Craft Beer followup? My only complaint is that it could have been better proofread – there are a lot of typos. Maybe Alan and Max will do a revised edition? Check it out. You can download the Kindle book for less than the cost of a pint. And after all the trouble they went to to put this out, the guys deserve a beer. Thank you! I am new to this, I appreciate the help.